Check Out our Extra Savings and Get Up to $750 on Early Booking Bonus + Much More! Get up to $750 Early Booking Bonus when you book 7 paid nights or more at these Resorts. Plus! 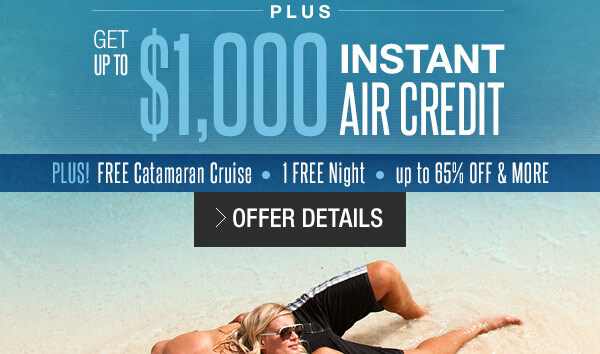 combine this saving with up to $1000 Air Credit, Free Catamaran Cruise for two, up to 65% Off & More! The resort's 280 existing rooms as well as a numerous other additions and enhancements that will offer Sandals guests the newest levels of Luxury Included® experience in line with Barbados' reputation. This glamorous all-inclusive resort regales you with sumptuous suites, a dazzling array of award winning restaurants and a breathtaking private off-shore island and absolutely everything you could ever imagine. Sandals Whitehouse perfectly blends the exotic allure of the Caribbean with the refined elegance of Europe, set on a 1,000-acre wilderness preserve and a unique two-mile stretch of beach. Simply relax beachside or sunbathe by one of three pools including Jamaica’s largest. Instant Air Credit offer is valid for new US/Canadian bookings made by Dec. 8, 2015 at select Sandals Resorts for travel now - Dec. 26, 2017. Instant Air Credit offers must be booked in conjunction with an air-inclusive or land only vacation package, which includes a minimum 6-paid night consecutive stay excluding free night promotion. Limit of one Instant Air Credit per booked room and up to two rooms allowed per booking. Instant Air Credit offers are in USD, applied to the base fare and excludes government taxes and fees, which must be paid at time of booking and is fully non-refundable. Cancellation of hotel booking will result in cancellation of all associated airline tickets. Baggage Fees may not be included. Both passengers must be booked for the same flight and itinerary cannot include voluntary stopovers. Blackout dates may apply. 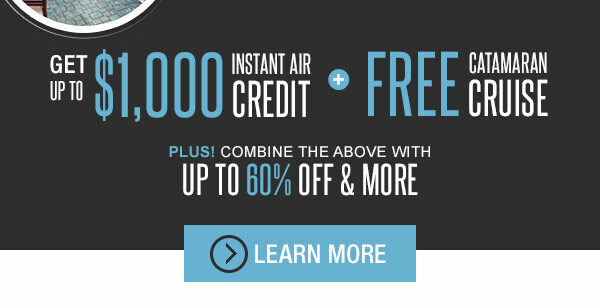 Offers are combinable with other Consumer savings promotions; not combinable with any other air credit offers. 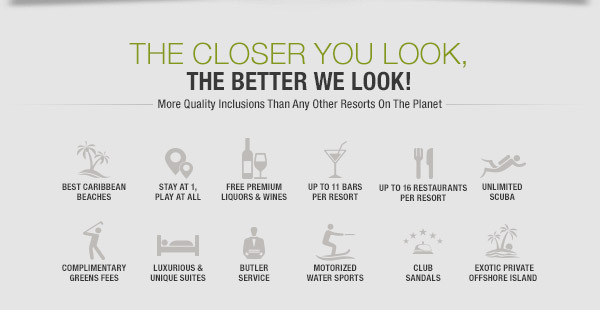 Offers can be combined with Sandals Select Rewards point promotions or WorldPoint redemptions. Offers are subject to availability throughout promotional period and may be changed or withdrawn at any time. Offers may not be applicable to group bookings. Other restriction and limitations may apply. For complete offer details click here. Early Booking Bonus offer is valid at select Sandals Resort for new bookings made by Dec. 8, 2015 for specific travel dates. View resort Accommodations Page to see applicable room categories and required minimum night stay. Offer is not combinable with other Consumer saving promotions and is not applicable for group bookings. Blackout dates may apply. Offer may be changed or withdrawn at any time. Save up to 65% offer is valid for new bookings made by Dec. 8, 2015 at Sandals Resorts for specific travel dates. Blackout dates may apply. Certain room categories are applicable. Maximum 2 person limit for offer. Offer is based on double occupancy, minimum 3-paid nights stay. Promotion is combinable with certain Sandals savings promotions for 2015, Group bookings may be subject to space availability. Offer may be changed or withdrawn at any time. Certain conditions apply. Free Night offer is valid for new bookings made by Dec. 8, 2015 at select Sandals Resorts in select room categories for specific travel dates. View resort Accommodations Page to see applicable room categories and required minimum paid night stay. Blackout dates may apply. Promotion is combinable with Sandals Select Points, however, it is not combinable with credit night vouchers. Other savings depend on resort and length of stay. Offer not applicable to Sandals Carlyle Inn. Offer may not be applicable for group bookings. Offers may be changed or withdrawn at any time. Certain conditions apply. Catamaran Cruise offer is valid for new bookings made by Dec. 8, 2015 at select Sandals Resorts in select room categories for specific travel dates. Offers are based on double occupancy, minimum 7-paid nights stay. Tour is not redeemable for cash and cannot be used to pay the balance of any booking, applicable tax, service charge, or gratuity. It has no cash value and cannot be sold or exchanged. Tour is only redeemable at an Island Routes Tour Desk and the tour must be taken during your qualifying stay. Black out dates apply.